I have to admit it was kind of difficult reading and reviewing 2 collections of short stories with fantasy and sci-fi leanings back-to-back. 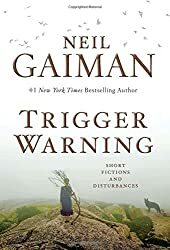 But I had started my purchased copy of Trigger Warning while in line to meet Neil Gaiman (click through to read my essay on 5 Minutes for Mom about the experience), and decided to get back to it sooner than later. Like my past experiences with Neil’s work (we’re on a first name basis after our 3 sentence conversation), I loved some of the stories, and others, not so much. And it’s a very different collection from the other book I recently reviewed, The Thing About Great White Sharks. Trigger Warning: Short Fictions and Disturbances is Neil’s third collection of short stories. Most of the stories were published previously, often at the request of an illustrator or the editor of a compilation, or in one case, his then-future-wife. The book’s introduction includes his reason for the title, a reader-beware warning, and a blurb on each story — the why, how, and where of the story’s origin. I started out reading that section straight through, but then decided it would be better to read each story’s blurb before reading the story, and it was a good way to go. Trigger Warning contains over 20 stories, poems, and other musings; the most unusual format is one I really enjoyed, “Orange,” told as the answers to an interrogation about a very unusual event. Some of the other stories I really enjoyed were in the traditional format, and also not overly long. In “The Thing About Cassandra,” a man’s junior high made-up girlfriend is suddenly real; or is she? “A Calendar of Tales” is made up of 12 vignettes, one for each month, as suggested by readers to Neil via Twitter. “And Weep, Like Alexander” speaks to the prevalence of smart phones and their increasing tendency to take over our lives. There are odes to some of Neil’s favorite stories and storytellers, such as Sherlock Holmes and Ray Bradbury, modern day fairy tales, and an odd love letter with a creepy stalker vibe, to name a few. There’s a Doctor Who story, set during Matt Smith’s first season, and it would do very well as an actual episode of the show, were they to bring back the Tenth Doctor and Amy Pond. And the final story revisits Shadow from American Gods; fans of the book will enjoy it. This is a very eclectic collection of stories and while fans of Gaiman’s work will enjoy most of them, they’re not for everyone. But if you are open to the unusual and unexpected, then I think you may be pleasantly surprised. He talked about “Orange” in that interview on NPR. It made me want to read it!